Both Medicare and the American Geriatrics Society recommend that each annual exam for seniors age 65+ include assessments for fall risk. Based on previous research, the American Geriatrics Society and the American Academy of Orthopaedic Surgeons has specifically recommended the Timed Up and Go Test for fall risk assessment. In a recent study from the Division of Geriatric Medicine, University of Pittsburgh, Laura Vicaro and colleagues suggest that a more efficient test may be just as useful. 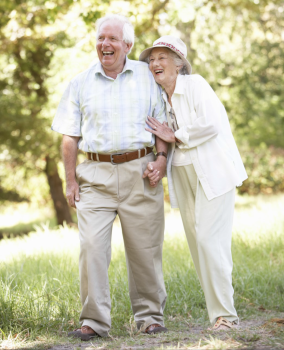 They enrolled 457 community-dwelling adults age 65+ in a year-long study. At entrance, each patient received either a Timed Up and Go Test (TUGT) or a gait speed test. To measure gait speed, the participant simply walked 4 meters while being timed. For each measure, they divided participants into three groups (slowest, intermediate, and fastest). Then they were able to assess the predictive validity of each test for various outcomes including the future risk of falls. Among patients with a history of falls, the study finds that the TUGT and gait speed both predict fall risk with adequate reliability, and they are essentially equal for predictive validity. Seniors with a history of falls who take 12 to 15 seconds to perform the TUGT are 47% more likely to experience a fall over the next year, and 15 seconds or longer correlates with 138% increase in the rate of falls (38% vs 90.6%). Likewise, a simple gait speed of 0.6 to 1.o meters per second correlates with a 51% increased likelihood of a fall over the next year, and a gait speed of 0.6 m/s or less correlates with a 145% greater likelihood of a fall (38% vs 93%). Similarly, both the TUGT and gait speed predicted health decline and future difficulty with activities of daily living. Combining the two tests added no predictive value. The authors suggest that gait speed may be considered as a more efficient alternative for the annual assessment of fall risk. This might be especially true for those practices that have not yet included TUGT in their normal geriatric wellness exams. The authors did note that TUGT may add opportunities for subjective assessment of fall risk because the TUGT incorporates transfers, turning, and gait speed into one test. It is well-established that strengthening and balance training can moderate fall-risk among certain patients. When a portion of the fall risk seems to stem from concerns such as lower extremity weakness, reduced range of motion, proprioceptive deficiencies, osteoarthritis pain, etc., consider Physical Therapy for your patients presenting with increased risk of accidental falls. Considering that 38% of people age 65+ experience at least one accidental fall each year, it is likely that a number of patients would benefit from a fall risk reduction program.